you might miss out on a grand adventure. Are you sure you are seeing what you think you are seeing? Yesterday I took my youngest grandchild to the park to play. As we were approaching the playground, I saw an old, chubby, long haired, scraggy bearded, scruff climbing on the play structure. I was concerned about exposing my two year old granddaughter to an unsavory character. As we got closer, I noticed a small child with this man and decided I could handle any problem that might come our way. I got my two-year old granddaughter out of the stroller and we headed for the playground. It was then the old man laughed at something his child had said. It was a hearty “Ho, ho ho,” that I had heard many times in my life. It was warmly jovial and instantly familiar. My pre-conceived notion began to melt away. Close up, he had a friendly smile, warm eyes, and a gentle manner. Not wanting to give his identity away, I quietly asked this gentleman in shorts and T-shirt if he ever dressed up for Christmas. His smile was affirmation enough. The real fun came when I asked my granddaughter if she knew who he was. 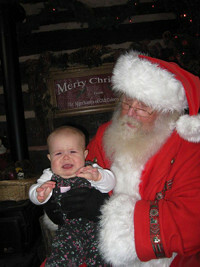 She didn’t even hesitate, “It’s Santa,” she said matter-of-factly. I let out a hearty laugh of my own. She knew what she was seeing. We had a grand time playing together. We talked a bit about who we are and where we come from. We talked about living close to grandchildren and being far away. We shared grandparent stories and discovered that we had lots in common. When he was ready to take his grandson home, we shook hands with genuine affection. After he left, I began thinking about how tricky it is to make assumptions about people. If I had trusted my first impression, my granddaughter and I would have walked on by the park and come back latter when he was gone. We would have never have had this unexpected adventure. Our culture is in the throes of fear. We assume that people walking down our streets, standing on the corner, playing in the park, wearing hoodies, are potential hazards. Eye contact, I am told, makes me vulnerable. It is true, a crazy might get me. But with a little caution I believe I can avoid all but the craziest of the crazies. By allowing our first impressions to guide us without gathering a bit more information, we miss the intersections with truly amazing people. So, I took a risk. I didn’t let the scruff scare me away. And, as far as I can tell, Santa spends his summers in Colorado with his grandchildren.